More than half the world’s population depends on the Asian monsoon water for agriculture. Beginning with the British mathematician Sir Gilbert Walker in the 19th century, much time has been devoted in trying to understand the summer rains. But the observational record is too short to explain long-term variability in monsoon weather patterns, making it difficult to forecast exigencies. 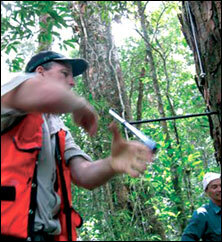 In the April 23 issue of Science, tree-ring specialists from Columbia University’s Lamont-Doherty Earth Observatory in New York have compiled drought records of tree rings from 300 locations after 15 years of field work. Nine are from India and the rest from Siberia, Indonesia, Pakistan and Japan spanning the last 700 years. 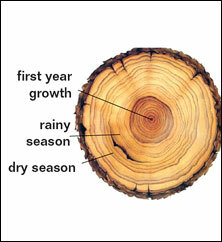 “For most tree species, rainfall determines annual growth, resulting in growth rings that are thick in rainy years and thin in dry ones. Very narrow tree rings can indicate years that experienced drought, when moisture conditions were not optimal for tree growth,” explained Carrie Morrill, scientist at the University of Colorado. An atlas—the Monsoon Asia Drought Atlas (mada)—was developed. It will put together yesteryear’s monsoon records and the accompanying weather conditions. Understanding the drivers of Asian monsoons would help predict future trends better. By studying the rings, scientists were able to determine at least four major droughts provoked by failure of the Asian monsoons. Northeastern China felt the pangs of the first one between 1638 and 1641, most sharply. It is believed to have influenced peasant rebellions that hastened the fall of the Ming dynasty. The second, between 1756 and 1758, coincided with the collapse of kingdoms in what are now Vietnam, Myanmar and Thailand. The East India drought hit between 1790 and 1796, the ripples of which were felt worldwide. In Europe, it led to crop failures that intensified the French Revolution. In Mexico it led to land ownership disputes. The last one, between 1876 and 1878 was the Late Victorian great drought. It led to the Great Madras Famine killing thousands in Chennai, Hyderabad and Mumbai. The study suggests that El Niño, the warm phase of El-Nino Southern Oscillations (enso), often coincides with a weak monsoon and droughts. “Southern China is currently suffering its worst drought in 80 to 100 years, bringing not only water shortages, but tensions with Southeast Asian nations downstream of its watersheds,” said lead author, Edward Cook. He added that enso might have been blamed for last year’s monsoon failure in India, but it was not strongly associated with the previous mega-droughts. “It is only in the 20th century that we are seeing this increasingly powerful relationship between El Nino’s warming phase and droughts in Asia,” he added. There is also no guarantee future climate patterns will mimic past ones, warned Ken Caldeira, climate scientist at the Carnegie Institution for Science in California, usa. Monsoons are caused by hot air rising over the continents, pulling in sea moisture. Future changes will also be driven by, say, changes in sunlight reducing haze from polluted industrialized areas of China. M Rajeevan from the National Atmospheric Research Laboratory, Tirupati expressed doubts over the definition of drought employed. “We can’t be sure if a 10 per cent deficiency of normal monsoon, as is the case with India Meteorological Department’s measures, qualifies as a drought,” he said.